I think that working as a street musician, also street mime too, is pretty hard because you're forced to do what you like in the middle of the street or maybe these who make you survive, surrounded by curious and occasional photographer. 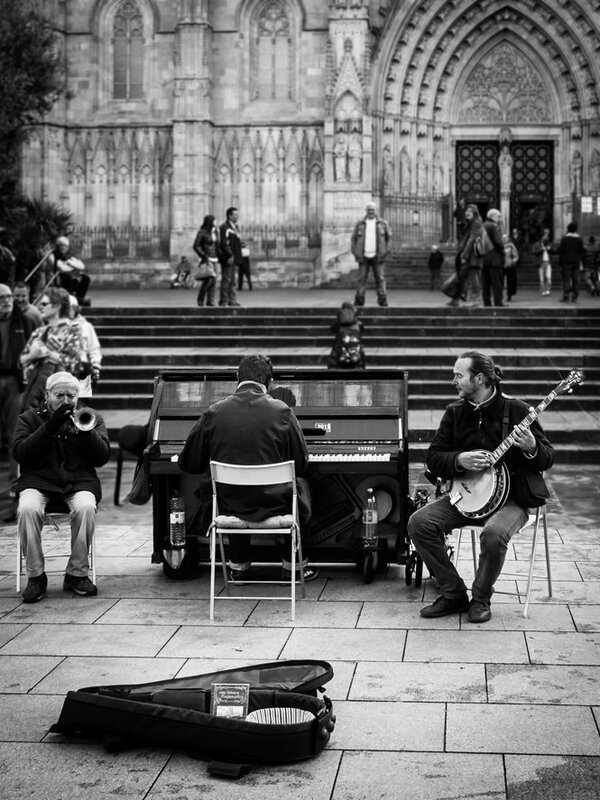 I noticed this trio, located in Cathedral Square at the time when they started playing. The musicians began to play the main theme from the movie "The Sting." Moments later the local police asked them a kind of accreditation that had printed a number "2013". Being everything in order, let them continue with their music. Love the b&w. Nice mix of instruments. Not a bad venue, and you get to do what you love. Great shot, from the case to the arches on the building. Great shot. Love the positioning of the musician's heads...and any shot of a banjo player is worth taking in my book! I like the image. I whish I could be listening to them. Really nice photo - great in B&W. Wish I could be there too. love your street scenes! There is so much to discover in them. A good street scene composition. Works well in mono. A lovely candid street shot.